Just how did life begin? 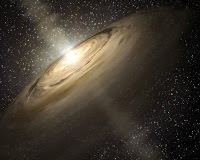 Were the compounds necessary for life present in the massive protoplanetary dust cloud that surrounded our young Sun? Did they then become a part of the planets of our solar system, including one that would eventually yield complex life? Did they arrive from some other source, such as a comet or meteor? For as long as mankind has wondered, the question of life's origins (abiogenesis - literally "lifeless beginning") has remained among those most frequently asked - and answered. Every ancient society produced its own explanation for the phenomenon of life, nearly every one of them involving a god or cabal of gods and/or goddesses. Most of these have been discarded as myths. But whether one believes in gods or rejects them entirely, the question of life's origins remains an important one. Today, science is the preferred tool for finding answers to questions like this one. Abiogenesis is a rich field of study, and though many solutions have been offered as explanations, only a few have held the interest of scientists. One of these that has recently gained a bit of ground is something called, panspermia. 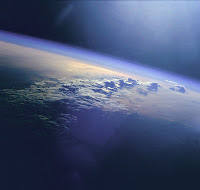 Panspermia, simply put, is the hypothesis that life or its components existed (indeed, still exists) throughout the universe, and that meteors, comets, or cosmic dust clouds served as delivery systems, bringing simple organisms - or merely some of the elements necessary for life - to a young Earth. First proposed by Anaxagoras, it was later picked up by such luminaries as Lord Kelvin and (the oft cited by creationists) Sir Fred Hoyle. In the 1970's, Francis Crick and Leslie Origel even suggested a variant of the theory called "directed panspermia," which implied that the precursors for life were delivered by an intelligent agent. One can almost hear the refrain of skeptics like me here: "Extraordinary claims require extraordinary evidence." However, panspermia, whether directed or undirected, still lacked evidential support. Then, in 1996, a team of NASA scientists examining meteorite ALH84001 - discovered in 1984 and believed to be of Martian origin - thought that several features appeared to be fossilized bacteria. After an initial wave of excitement, however, a controversy erupted over whether the structures could have been formed by non-biological processes instead. Following five years of rigorous scrutiny and debate, only one line of evidence was left - magnetite crystals arranged in a way suggestive of the presence of bacterium. Ten years after the controversial findings were presented, even this had been all but dismissed. Still, scientists know that most (if not all) of the compounds necessary for life exist elsewhere in the universe, and efforts to determine if panspermia is viable continue. Dr. Rainer Glaser, Professor of Chemistry at the University of Missouri-Columbia, recently completed a research paper titled, "Adenine Synthesis in Interstellar Space: Mechanisms of Prebiotic Pyrimidine-Ring Formation of Monocyclic HCN-Pentamers," that suggests that one of the precursor elements necessary for life, adenine, exists in interstellar dust clouds which, in turn, may have delivered the molecules to Earth. "The idea that certain molecules came from space is not outrageous," Glaser says. "You can find large molecules in meteorites, including adenine. We know that adenine can be made elsewhere in the solar system, so why should one consider it impossible to make the building blocks somewhere in interstellar dust?" Adenine is a nucleotide base considered one of the most important organic molecules, since it bonds with other molecules to give DNA its signature double-helix structure and is one of the four bases of both RNA and DNA. In a variation of the famous Miller-Urey experiment, Juan Oro found that, in a reduced atmosphere, hydrogen cyanide (HCN) could produce not only amino acids, but also a large amount of adenine. Thus, Dr. Glaser intended to study the mechanisms for synthesizing adenine in interstellar dust clouds, which have been shown to contain high amounts of HCN. Dr. Glaser's research, which was published in the peer-reviewed journal Astrobiology, describes the fusion of adenine and other essential chemicals. He also suggests that astronomers take a closer look at those dust clouds with the intent of "narrowing the spectrum of where life could exist" in our galaxy. "There is a lot of sky with a few areas that have dust clouds. In those dust clouds, a few of them have HCN. A few of those have enough HCN to support the synthesis of the molecules of life. Now, we have to look for the HCN concentrations, and that's where you want to look for adenine," he said. "Chemistry in space and 'normal chemistry' can be very different because the concentrations and energy-exchange processes are different. These features make the study of chemistry in space very exciting and academically challenging; one really must think without prejudice." Whether this new research stands up to further scrutiny remains to be seen. Though science has not yet answered the questions mankind continues to ask concerning the origins of life, with each tiny stride forward, a bit of information is added to fill the gaps left vacant as our myths are discarded. With continued research, we may eventually find answers to the burning question, where does life come from? One thing, for now, is certain. Myths fail to satiate our curiosity, and are a poor substitute for the invigorating, intriguing, and fascinating truths revealed through scientific discovery.